The pictures shown below were taken of the work detail during the placement of U.S. minature Flags at Brooking Cemetery, Raytown, MO prior to Memorial Day 2006. Over 500 U.S. minature flags were placed on the graves of U.S veterans who are buried at Brooking Cemetary. Prior to Memorial Day each year, Westport Camp #64 places U.S. minature Flags on the graves of U.S veterans who are buried at Brooking Cemetary. 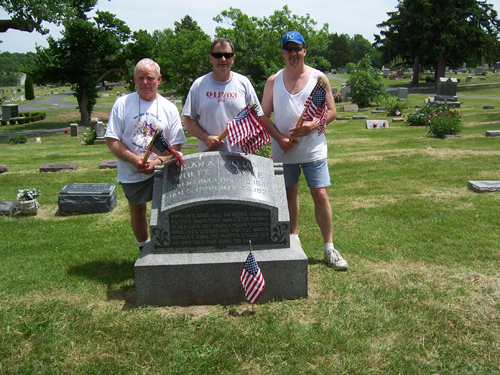 Pictured here from L-R, Westport Camp #64 Commander, John Martin, Dirk Stapleton and Brian Smarker are shown here after the placement of U.S. minature Flags at Brooking Cemetery, Raytown, MO 0n 26 May 2006. 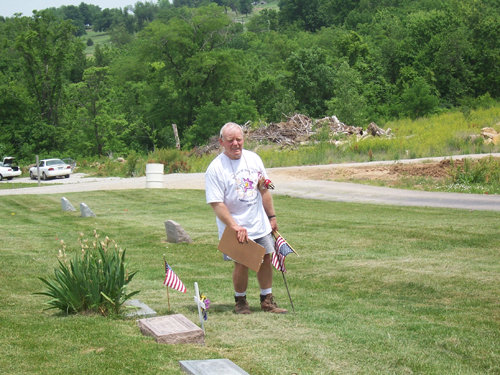 Westport Camp #64 Commander, John Martin is shown here on 26 May 2006 placing U.S. minature Flags on the graves of U.S veterans who are buried at Brooking Cemetary, Raytown, MO. 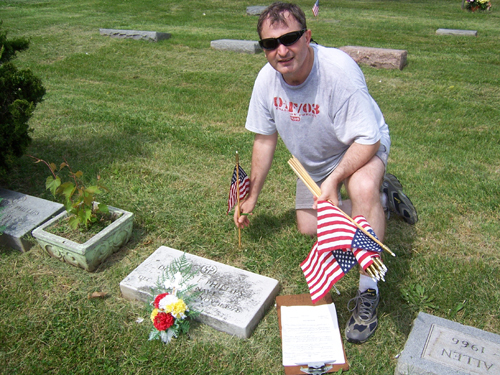 Westport Camp #64 member Dirk A. Stapleton shown here on 26 May 2006, making a final adjustment in placing a U.S. minature Flag on the grave of a U.S veteran buried at Brooking Cemetary, Raytown, MO.